Since today is the birthday of Louis Comfort Tiffany, I thought it might be interesting to have a look at some of the magnificent examples of Tiffany design with which Baltimore has been favored. Louis Comfort Tiffany’s career lasted from the 1870s through the 1920s. He was the son of Charles Lewis Tiffany who founded Tiffany & Company, but chose not to join the family business, instead embarking on a career as a painter. Although he never stopped painting, Tiffany began in the late 1870s to concentrate on the decorative arts for which we remember him today. He and his studios worked in a vast array of mediums, including stained-glass windows, glass mosaics, lamps, ceramics, enamelwork, and jewelry. Tiffany was appointed the first design director of Tiffany & Co. upon his father’s death in 1902. He also continued his association with Tiffany Studios, which did not cease operations until his own death in 1933. 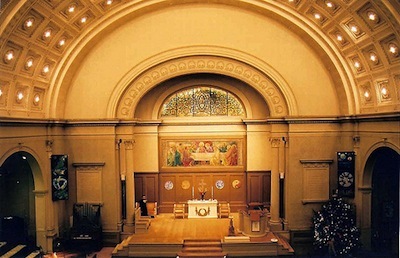 The First Unitarian Church of Baltimore has one of the only three versions of this particular Tiffany glass mosaic design for the Last Supper known to exist. It was installed in 1897 and measures 18′ wide x 9′ tall. The designer was Frederick Wilson who worked for the Tiffany Glass and Decorating Company. 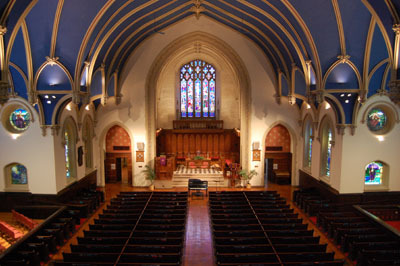 Brown Memorial Presbyterian Church was dedicated in 1870; when it was enlarged in 1905 the church commissioned Tiffany Studios in New York City to create its stained glass windows. 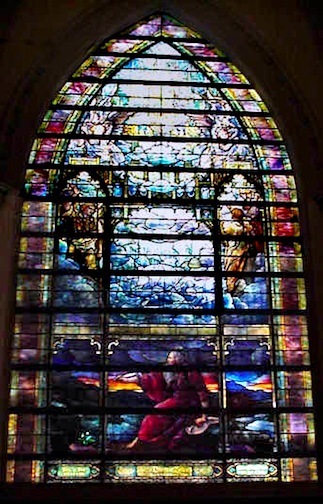 There are 11 documented Tiffany windows, including two transept windows which measure 40′ high by 16′ wide and dominate the interior. 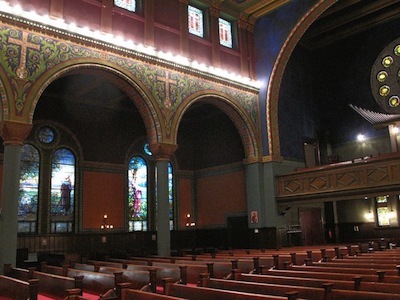 St. Mark’s Lutheran Church boasts a complete interior created by Louis Comfort Tiffany. The building was opened in 1898 and among its treasures are mosaics, lamps, and stained-glass windows. It is one of the few intact Tiffany-designed interiors left in the world. I never knew these treasures were so close to home – many thanks! !